DoubleLine Capital Chief Investment Officer Jeffrey Gundlach said its time for fixed-income investors to prepare for rising interest rates and higher inflation by reducing the duration of their positions, moving money into cash and protecting against volatility. This is a big, big moment, Gundlach said during a webcast Thursday. Interest rates have bottomed. They may not rise in the near term as Ive talked about for years. But I think its the beginning of something and youre supposed to be defensive. 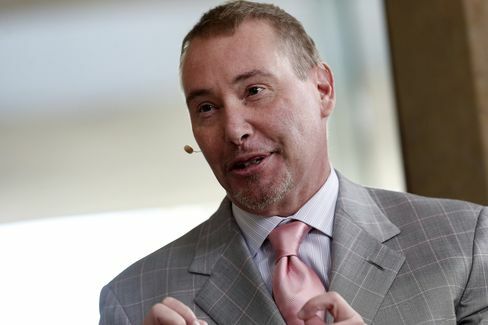 Gundlach, 56, has built a career as a successful money manager and financial prognosticator. This year, his flagship $61.7 billion DoubleLine Total Return Bond Fund is lagging behind the benchmark Bloomberg Barclays U.S. Aggregate Bond Index while avoiding high-yield debt, which is up 15 percent, and shunning longer-duration positions. The Total Return funds effective duration is 2.4 years, less than half of the index, Gundlach said. He cited a July low of 10-year Treasuries that didnt hold as evidence interest rates have hit bottom. The fund manager said rates on the U.S. 10-year bond may surpass 2 percent by the end of 2016. Total Return gained about 4 percent this year through Wednesday, trailing the benchmark bond index by 2 percentage points, according to data compiled by Bloomberg. Its beaten the index over three and five years. The majority of Total Returns assets were in mortgage-related securities as of June 30, according to a DoubleLine fact sheet. Gundlach also stuck to his prediction that Republican Donald Trump will be elected the next U.S. president. He said both Trump and Democrat Hillary Clinton have advocated more spending on infrastructure, which would add fiscal stimulus to the economy as central bank low- and negative-interest rate policies across developed markets show diminishing returns. This idea that fiscal stimulus may be coming seems to be getting sniffed out by the bond market, Gundlach said. More debt spending may increase the cost of government borrowing by adding supply and making investors demand higher yields, he said. People say, How can rates rise? he said. Thats how they can rise and theyre sort of rising already. Unlike many other active managers, Gundlach has continued to attract new money, including a net $158 million in August to the Total Return Fund, according to Bloomberg estimates. DoubleLine Capital managed more than $102 billion as of June 30. The size of Total Return is becoming a concern for David Schauer, chief investment officer at Hanson McClain Advisors, with $2.1 billion under management, because it could make it harder to maneuver markets. We tend to stay away from funds that are very large, Schauer, whose Sacramento, California-based firm first invested in DoubleLine Total Return in 2010 and now has about $200 million in the fund. Probably if it were to grow to $75 billion, wed be trimming back either substantially or completely.